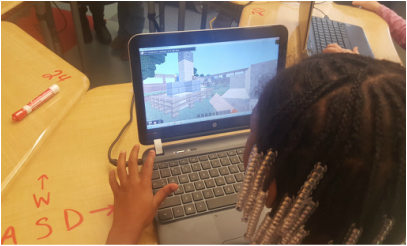 MinecraftEDU is a school-friendly version of the game kids love. Whether it's by creating a world of their own or solving authentic problems based on real-world situations, our students are able to engage with curriculum in a whole new way. We were able to purchase our subscription to MinecraftEDU because we applied for and were awarded a grant from the Concord Trust organization. How are we using the program? Read below. Fifth grade students built colonies and practiced trading with other groups for necessities. We compared and contrasted this experience with what early American settlers went through when establishing the New England colonies. Third graders built replicas of landmarks from the country they are studying for their country project. Second grade students visited the "Funny Farm," where they practiced using addition and subtraction within 100. They built flower gardens, stalls for horses, and went fishing. First grade students created "Number Zoos," where they showed off their awesome number sense! Third grade students showed what they know about area and perimeter by exploring and constructing buildings. Integrating the engineering design cycle with Minecraft is a natural fit. Third and second grade students used the design cycle to build redstone roller coasters. They asked questions about roller coasters, explored available materials, built a model, tested it out by riding in a minecart, and presented their creations to peers.